People from all corner in the country gather in Ho Chi Minh City which is considered as a good land for a bird to perch. The lovely feature of the land is residents’ heart to disadvantaged people;,many people joined hands to bring good things to the lives of people in need. In 2018, a fire erupted Carina condominium in Binh Chanh district driving thousands of people being homeless without money and clothes. While firefighters were struggling to contain destructive wide fire and responsible agencies were cordoning off the area, many charity groups arrived in the condominium to provide food, drug, clothes and drinks for unfortunate people. City dwellers are familiar with the long line of poor patients or patient relatives in hospitals waiting for their turns of taking free rice, food and drinks. At first, charity groups outside hospitals spontaneously cooked food for destitute patients but later, realizing that poor patients with incurable illness who stay long in hospitals for treatment are in need of nutrition, charitable volunteer groups have gradually set up in hospitals to provide food for disadvantaged people. The efficient operation of charitable volunteer groups outside hospitals have received supports of enterprises, benefactors and social organizations. For years, Sai Gon Giai Phong newspaper has played as a bridge between benefactors and charitable volunteer groups. Monthly, benefactors and kind-hearted readers support the newspaper’s fund for poor patients in hospital kitchens to cook free food for patients including Bao Hoa kitchen in district 1 and kitchen in Tumor Hospital in Binh Thanh District. 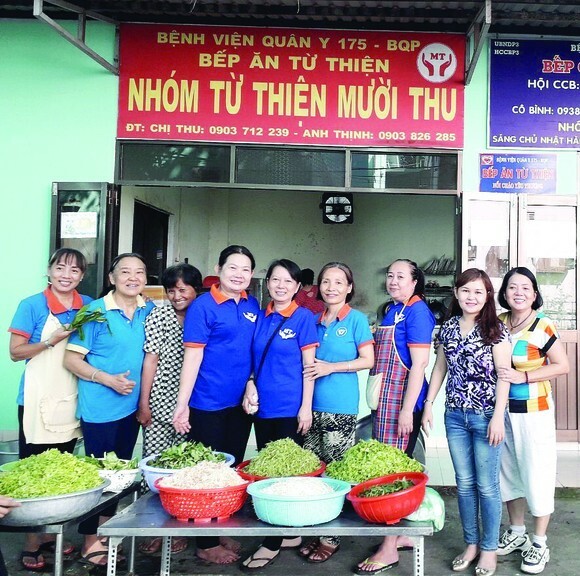 Lately, a charitable kitchen of the same kind has been established in Tu Du Maternity named Muoi Thu and other kitchen of veteran association. Group of senior Buddhist followers’ Philosophy of life is giving means remaining forever. They are retiree teachers, traders and businesspersons of small businesses wish to improve the quality of life of the most disadvantaged groups. For years, they have been doing this in spite of their health and financial condition as their heart to disadvantaged persons. Free ice tea or bread containers in pavement in front of a house in the city or poster of gratis bike repair for people with disabilities make disadvantaged people feel warmer when leaving their hometown to live in alien city.